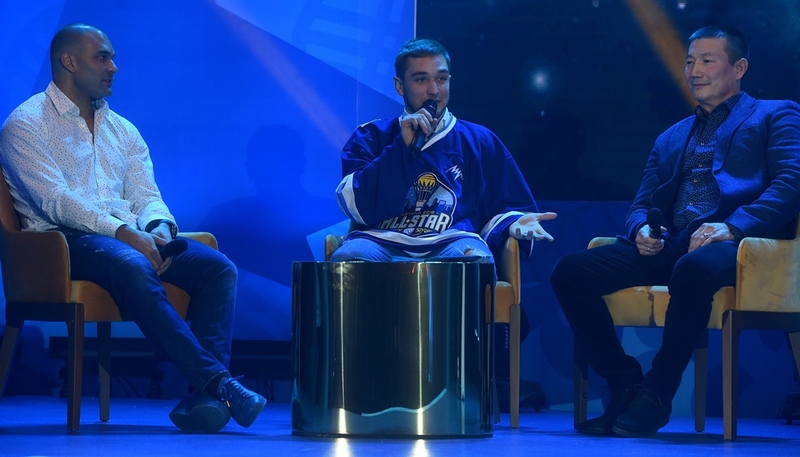 On Friday, January 12, in a hotel in the modern center of Astana, the League hosted a presentation of the elite band of players who will compete in the KHL All-Star game. The players appeared on a screen in the form ofsuperheroes, with - of course — the accompanying superpowers, and then the coaches chose a team of young players and commentators. This was the curtain-raiser for the climax of the The Week of Hockey Stars. 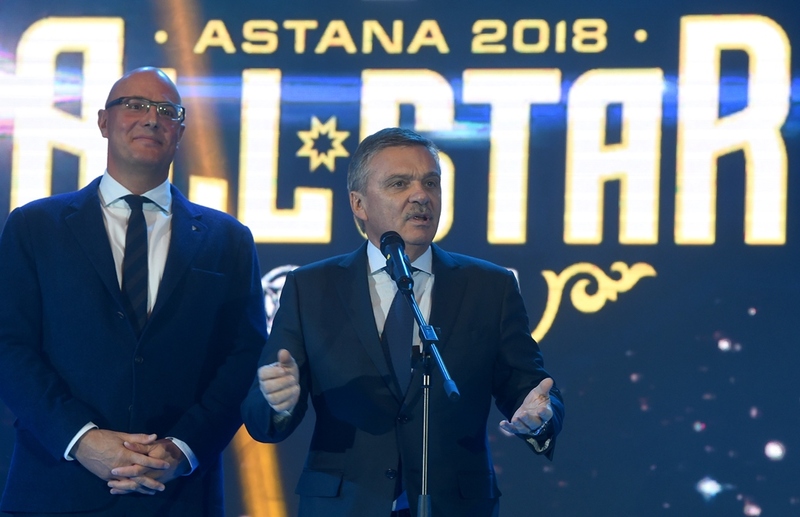 The Astana public has already been delighted by the Women's Hockey League All-Star Game and the MHL Challenge Cup, so today, in the capital of Kazakhstan, thoughts turned to the big events on Saturday and Sunday as the assembled media and dignitaries were treated to an impressive official presentation of the stars who will take part in the Kontinental Hockey League All-Star Game. 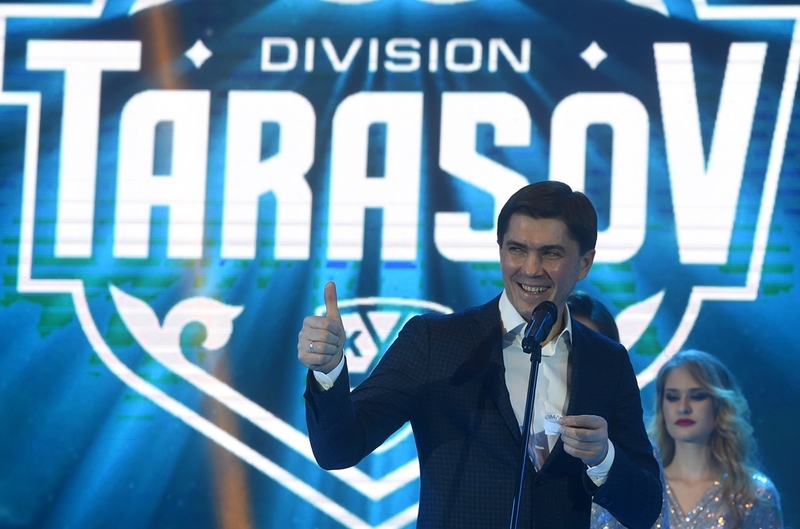 A day before, the city of Astana was shrouded in a whirling blizzard, but the weather turned temperate early on Friday morning for the arrival of the KHL's finest players. When they arrived at the airport, the players were greeted by girls in Kazakh national costume, each bearing refreshments, and scenes of local color continued to decorate the day right up to the evening reception. In the lobby of the chosen hotel, an orchestra with traditional Kazakh instruments was playing folk music, and everywhere was decked out in the blue and yellow of the Kazakhstan flag, including a platform erected in the foyer to serve as a temporary TV studio. It would not be Kazakhstan, of course, without a tribute to space travel. The festival combines the themes: a Week of Hockey Stars in the heart of Kazakhstan – the KHL Galaxy, so the main logo of the event appeared on a giant screen in front of the stage, seeming to hover against a background of infinite space, a reminder that up there in the heavens is a commemorative KHL puck and replica Gagarin Cup orbiting the earth. Despite their early flight, the mood of the players was jolly and upbeat. Dmitry Kagarlitsky and his wife,Yekaterina, cheerfully gave interviews to camera, while Kharlamov Division assistant coach Daria Mironova was explaining something in great detail to Severstal and Tarasov Division goalie Julius Hudacek, while around us orbited Nigel Dawes. Andrei Nazarov, in his lucky jacket, was also all smiles. - Of course, for me it is a holiday. We all work hard in the KHL, and the All-Star Game is an event on such a massive scale that there is no way anyone should miss it. Have I met my assistant, Maria Bass? Yes, of course.She'll be in charge of defense and powerplay... well, everything, in fact, so if anything goes wrong she can take all the blame. I'm kidding, of course. The event began with a welcoming speech by KHL President Dmitry Chernyshenko. He thanked the hospitable hosts – the government of the Republic of Kazakhstan, the akimat of Astana city and Barys hockey club. Chernyshenko reminded the audience of the main intrigue of the evening: they would soon know the identitiesof the four players who were judged the best in the Challenge Cup, and thereby earning a place in the KHL All-Star Game. Dmitry then called to the stage an important visitor: IIHF President Rene Fasel. - It is a great pleasure for me to be here – said Fasel. – I'm very glad to meet good friends and see this wonderful arena. 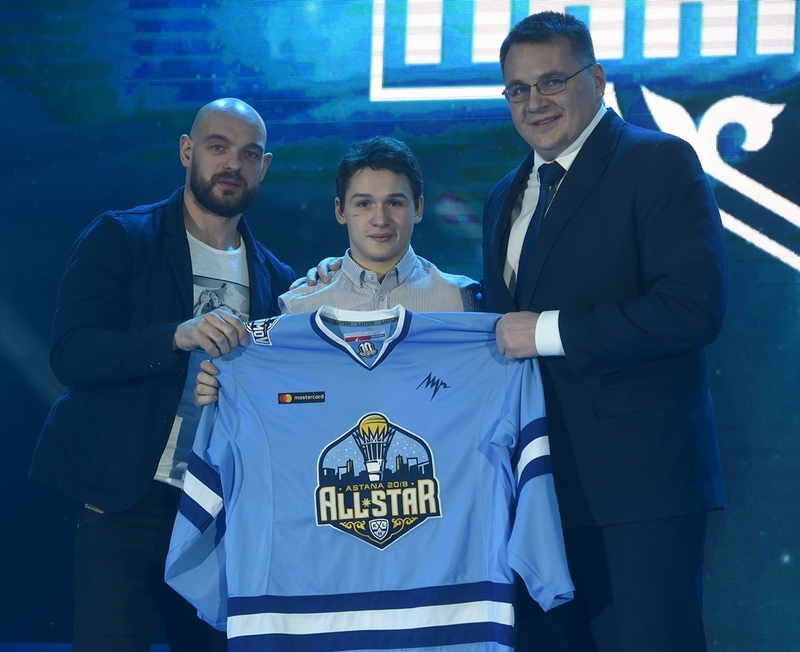 The KHL All-Star Game is a great event, and many of the participating players will then go to the Olympics. They have a lot of fun here, and the great atmosphere will bring everyone even closer together. It'll be a fantastic weekend! And then from the stage sounded the names of the quartet of young stars of the future who would play in the All-Star Game with the stars of today: German Voloshin (Amurskie Tigry), Nikolai Kovalenko (Loko), Igor Geraskin (Almaz), and Yegor Korobkin (Stalnye Lisy). 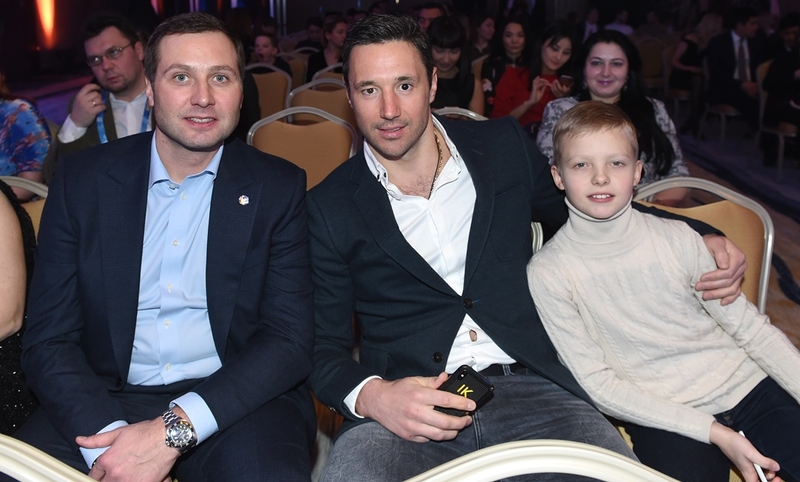 The presentation of the players had an original theme, so not, as many might have predicted, stars or space.Instead, each player was a superhero with a superpower, so that in the Bobrov Division, for example, Igor Shestyorkin was a magnet for the pucks, Dmitry Kalinin had powers of accelerated regeneration, and Ilya Kovalchuk was a hypnotist! Just then, it eerily turned out that coach Jukka Jalonen had not made it to Astana in time for the ceremony, so his place on stage was taken by the hypnotist himself, Kovalchuk, but thankfully, his duties were limited to drawing lots for the Challenge Cup player and TV commentator for his Division team. As for the Tarasov Division, head coach Igor Nikitin could control the cold, goaltender Julius Hudacek could induce smiles, and formidable D-man Staffan Kronwall was surrounded by a force field (as if he needed one), Nikita Nesterov was invincible, Vojtech Mozik was invisible to opponents, and Kirill Kaprizov had become a tornado. Onward to the Kharlamov Division. What power had fortune bestowed upon coach Andrei Nazarov? Of course, the gift of persuasion! Andrei Markov received eternal youth, Emil Garipov developed impregnable armor, Sergei Mozyakin had the power to conjure up a meteor shower, and Nikita Tryamkin appeared to be a werewolf. There remained only the Chernyshev Division, whose coach, local lad Galym Mambetaliev, was now the envy of sports coaches the world over – he had the gift of alchemy! Linus Omark was a magician and Linden Vey was a psychic – if he is genuine, of course, he would have known that already. The evening ended with a presentation of awards for loyalty to the KHL. Throughout all ten seasons of in the League, Kevin Dallman and Denis Parshin have battled away on the ice, and handing them their rewards for such sterling service were Askar Mamin, President of the Republic of Kazakhstan Hockey Federation, and IIHF chief Rene Fasel. After the ceremony, some of the players shared their impressions with KHL.ru. - It was a great idea for a ceremony. I have been given the power of regeneration. And why not? I'm in a super mood, but I only arrived here early this morning, had a rest, and then came straight to the presentation of the players. I didn't get to see it all in detail. As for the upcoming event, this will be the first time I've played in this format, so it will be fascinating to see how it all turns out in the tournament games. I haven't given any thoughtyet about my own role. And straight after the All-Star Game we have a really tough road match against SKA, so I will fly straight from here to Petersburg. But I'll still get a rest day. I will try out my powers of regeneration. (Laughs). - Being a tornado sounds good to me. I like it. Both the nickname, and how everything is set up here. Although, to be honest, before flying out I read the news about the weather in Astana, and it showed a clip of the raging storm... I confess I was a little bit worried that the flight might be delayed. But everything went well. After take-off, I went to sleep, and if I sleep on a plane it's a very deep sleep. Anyway, The Tornado is not afraid ofsnowstorms. Has it been easy to adapt to this relaxed atmosphere after playing in the Championship? Yes, I have managed fine. I'm sure I can switch back to a working rhythm very quickly. Tomorrow, hockey fans will witness the KHL Master Show, and clearly, many surprises await.